Today, things don’t seem much different – we have a powerful group of internationalists that seem to control continents and countries, constantly imposing their will on others under the guise of well intentioned intervention. But when you look at how many people are now aware of this, things do start looking a little different. It’s no longer something to fear, but rather something we’re tired and bored of, and something that seems to be changing as we move through 2018 and beyond. 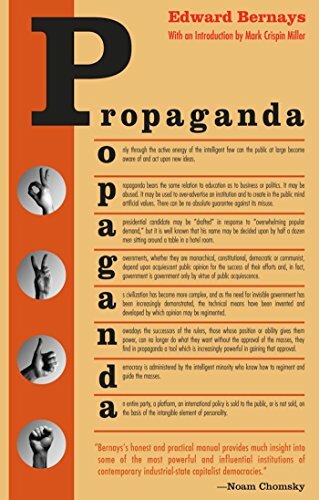 Propaganda Edward Bernays Best Price: $7.13 Buy New $8.99 (as of 12:00 EDT - Details) The issue is, all of these areas are ultimately controlled by one power, and that’s far from a conspiracy theory. It’s no secret that a small group of people literally own all of the worlds’ resources and thus dictate the policies which surround them. This has resulted in quite a mess here on planet Earth, but only because we as a human race are accepting it, which is what the ending of the the quote above implies. The truth is, we can change the game anytime we please, all we have to do is wake up. It’s clear that this group of powerful interests is not really concerned with the well being of humanity, and we see that leak through in various forms, from fraud to corruption and the revolving door that exists between the government and our corporate/financial world. I’ll let you take a listen. In the speech below, he outlines several issues we still face today, and plans on how to move forward. Well, Welch clearly was one who wasn’t afraid, and what he was bringing attention to all the way back in 1958 is something that countless other figures around the world have been doing for decades, all the way up to the present day, and it’s most relevant, especially if you look at everything that’s happening with regards to Syria and Iran right now, and the overall Deep State hand which seems to control what’s going on. Welch and the John Birch society were naturally branded as conspiracy theorists and ridiculed by mainstream media, which happens today far too often to those who come out and speak against the ‘accepted’ rhetoric. It’s amazing how many documents, and how many politicians and academics, and there are hundreds of them, who have been trying to create awareness about this Deep State, yet if you tell the average person who is not really concerned about what’s happening on the planet, they might look at you like you’re crazy. It’s important to acknowledge, because when we don’t acknowledge, when we look away, we open ourselves up to manipulation on scales we haven’t even realized, but we are in the process of waking up, and at least we are starting to see these things, after decades of people like Welch openly speaking up about it. These people represent today what seems to be the majority. Humans are not stupid, when evidence and information is available, some of us will seek it out. It’s past time we rely on our television screens and programs to tell us ‘what is.’ It’s high time we look, investigate, and find out for ourselves. Our world, and the systems which surround all aspects of human life are in the hands of what seem to be a group of, what most people would refer to as, psychopaths. But it doesn’t really resonate with us here at CE to use any kind of hatred anger or finger-pointing. These are the energies which are used against us, and have contributed to the state the world is in today. The truth is, opportunities have presented themselves and will continue to do so, whether it be GMOs, what’s happening in Syria, 9/11 and many more, the deception that plagues our world will be harder to prolong once we are aware of it. By simply being aware of it there will be more instances where we can prevent it. The big question with information like this is, so what? Well, as briefly explained earlier, it’s our consciousness that’s used in order to justify certain actions by the global elite. We are driven into the acceptance of various things, whether it be deadly household cleaning agents, GMO’s, war, and more, through false means. For example, if everybody on the planet believed without a doubt that 9/11 was an inside job, do you think the this global elite would have been able to invade Iraq? Probably not. This is one of many examples where ‘waking up’ can help. By simply doing this, and letting go of the fear and dealing with paradigm shifting affect it can have on your life, your experience here will most likely change in itself as a result of just that! There is really nothing to be afraid of, but more so be excited about, as we are in the midst of some great changes, some of the biggest in human history.